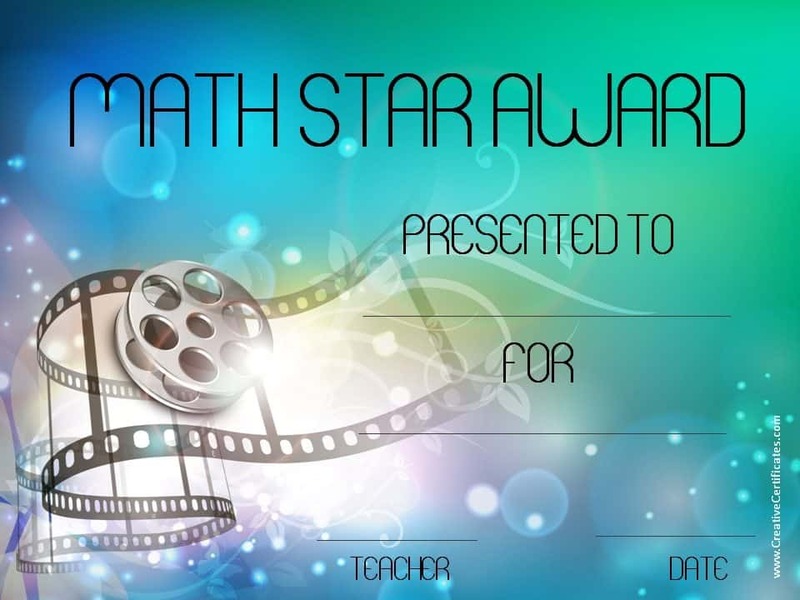 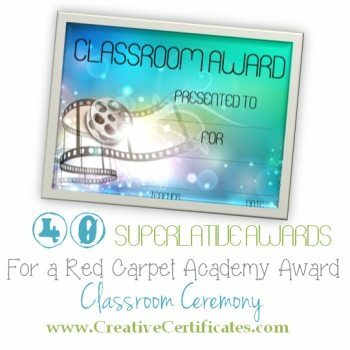 40 free printable superlative awards which can be used for a red carpet award ceremony at the end of the year. The end of the school year is a very exciting time for both teachers and students. Why not celebrate with an Academy Awards-style ceremony recognizing students’ achievements or special traits. The event can be fun and memorable. You can create an Academy Award atmosphere by making a red carpet by laying red fabric on the floor and decorating the classroom accordingly. Allow students to dress up for the ceremony. Make the award ceremony fun and positive. It is bound to be a memorable event. Each child receives a unique award certificate (we have 40 different options available and they are all free!) which will serve to remind students of the special year you spent together. This superlative certificate template can be used for any purpose. Use this printable superlatives list to assign an award to each student. Once you have assigned an award to each child you can start preparing the certificates and write your students’ names on the certificates. Preparing the superlatives list provided will ensure that there won’t be students who receive more than one certificate and others that don’t get any. Some of these awards recognize academic achievement but since not all students excel and stand out we have included additional awards to enable each student to receive an award certificate for a unique personality trait or achievement. This will ensure that each child is recognized for talent, achievement or effort. There are many different ways to reward each student. Funny award ideas are great and make the ceremony fun. It is important to ensure that it is not at the expense of any of the students. Try and find funny award ideas that are positive and don’t hurt anyone’s feelings. “Most likely to awards” can be fun too. 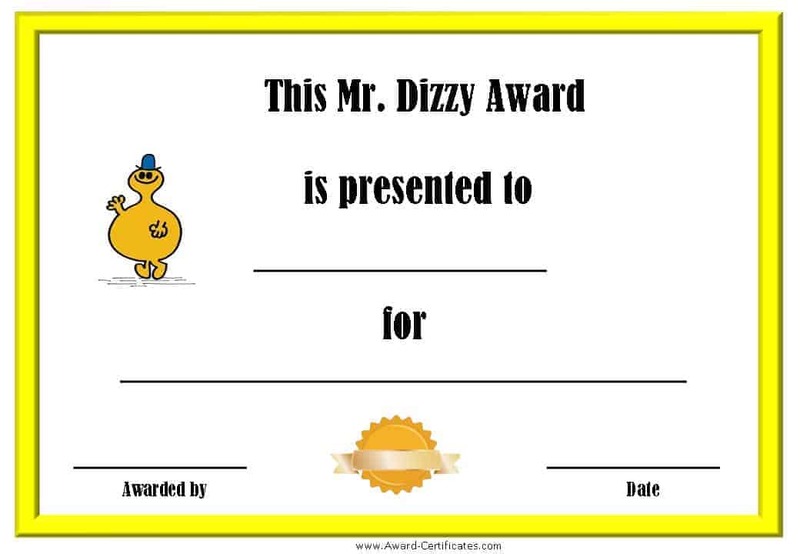 We also offer Mr Men awards that can be printed free and used as superlative certificate templates. 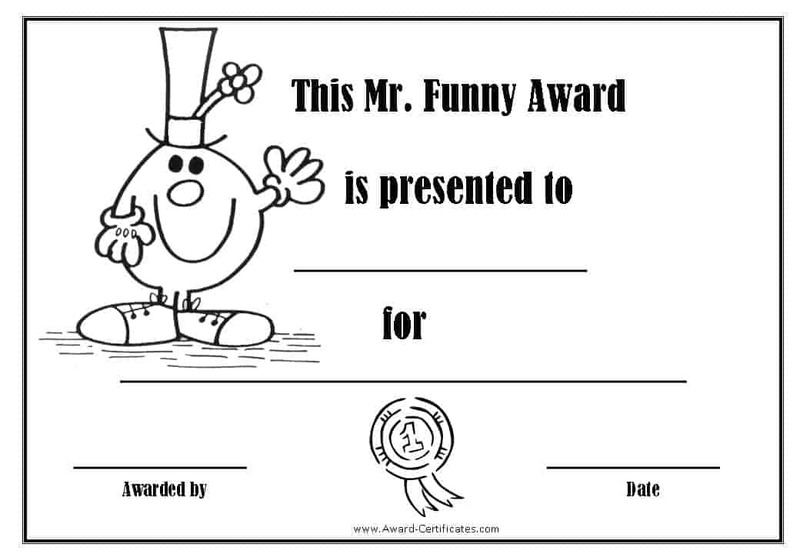 There are over 40 award certificates for nearly every trait both humorous and serious. The presentation ceremony is bound to be fun! There is a colored and black and white version of each printable certificate. Are you looking for an award certificate for someone who is always cheerful? 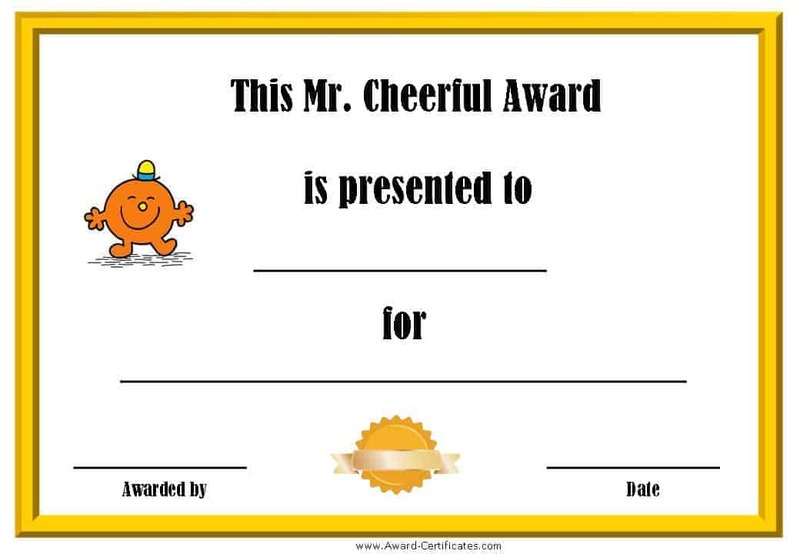 This Mr Cheerful award certificate can be presented to someone who is always optimistic, happy and cheerful. Are you looking for a humorous printable award certificate for someone who is very funny? This Mr Funny printable certificate is a perfect award for the class clown or someone with an excellent sense of humor. 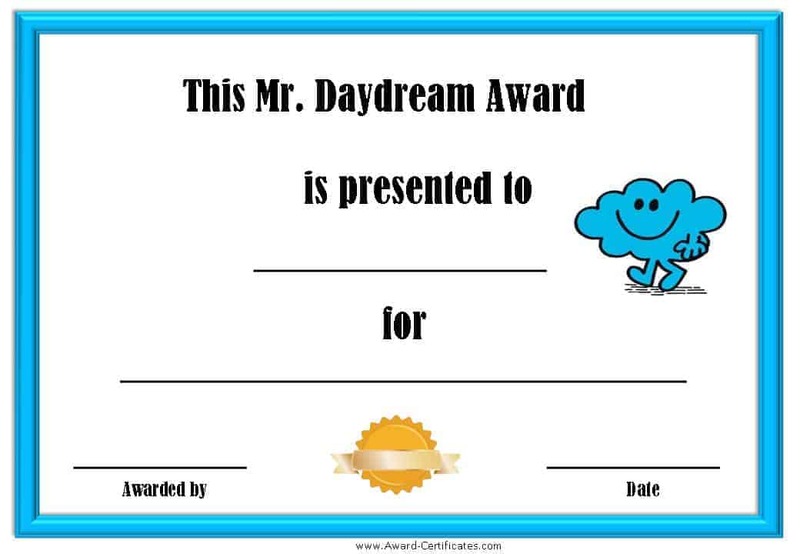 This certificate can be awarded to someone who is constantly daydreaming. 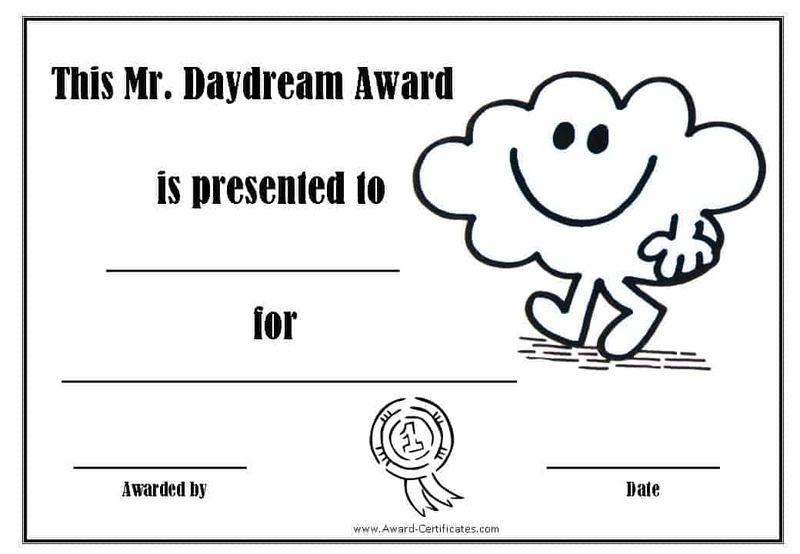 One of those people who are always in their own world just like Mr. Daydream. 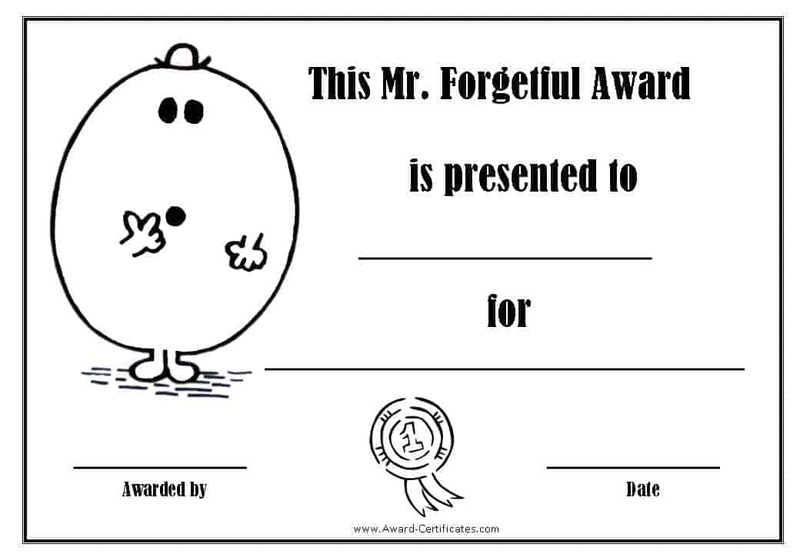 Do you need a funny certificate for a forgetful person? This Mr Forgetful printable certificate can be used for that purpose. 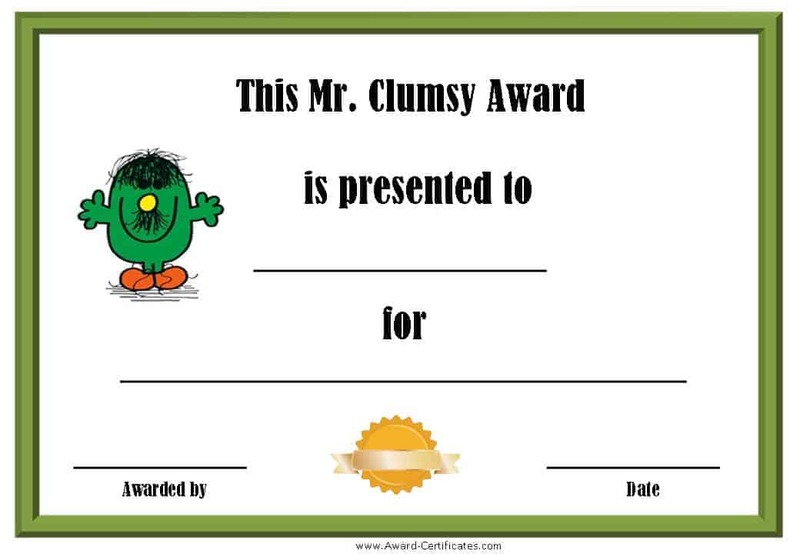 Are you looking for a fun and humorous award certificate for someone who is very clumsy? 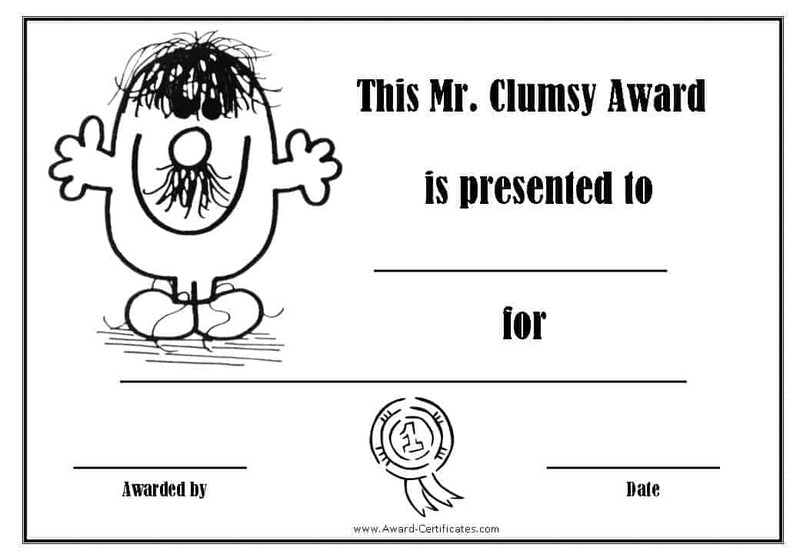 This Mr Clumsy printable certificate can be used for that purpose. 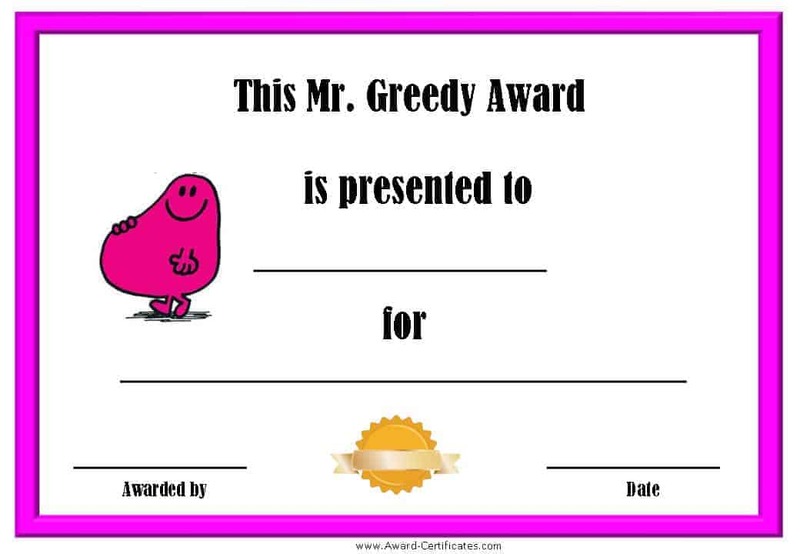 Are you looking for a humorous printable award certificate for someone who is very greedy? 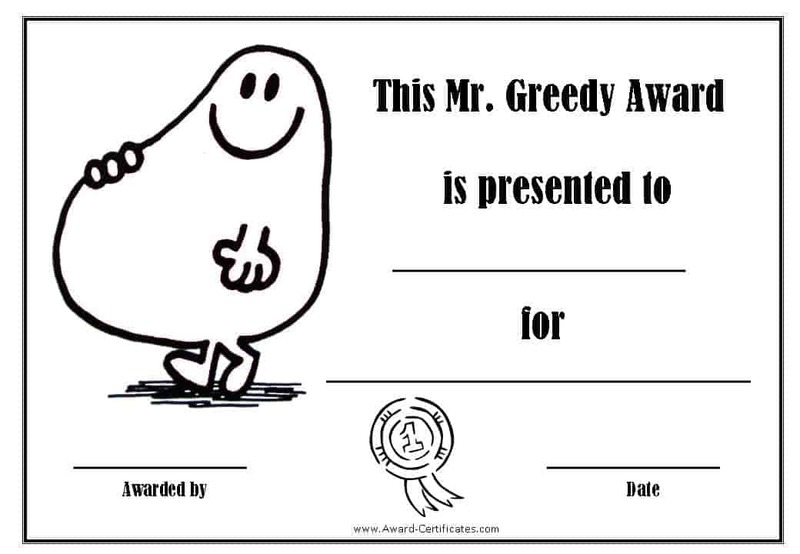 This Mr Greedy printable certificate might be exactly what you need. 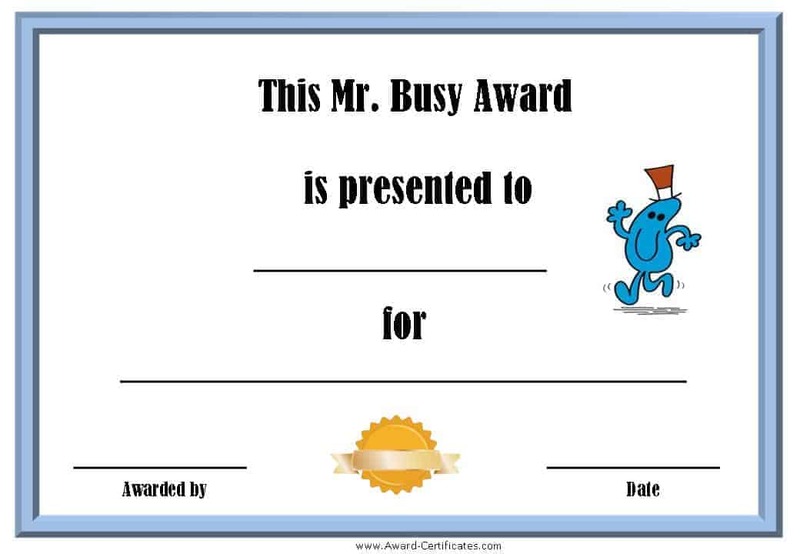 This Mr Busy award certificate can be presented to someone who is always busy. 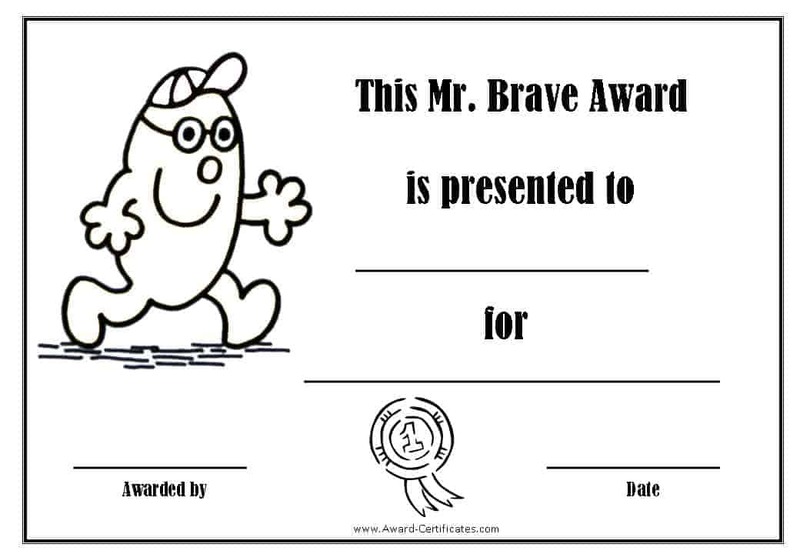 This Mr Brave Award Certificate can be awarded to someone for being brave. 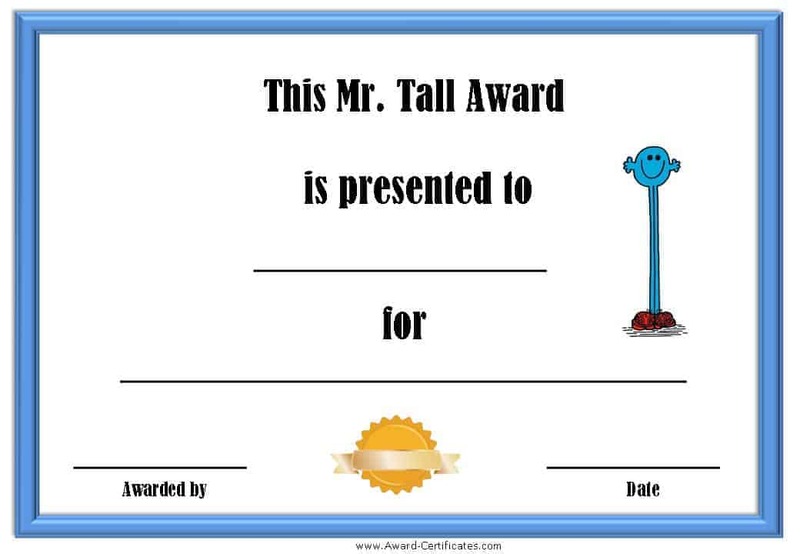 This Mr Tall Award Certificate can be awarded to the tallest person in a class or group. 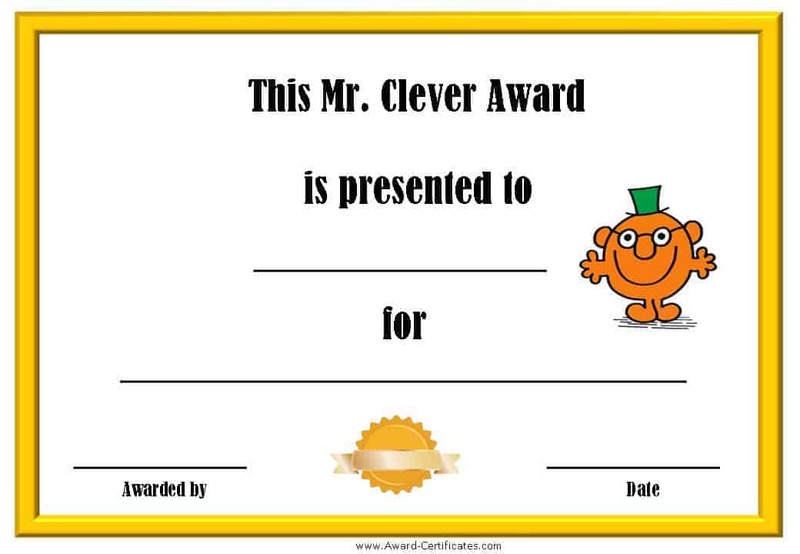 These Mr Clever award certificates can be presented to someone who is clever, has excelled academically or for achievement. 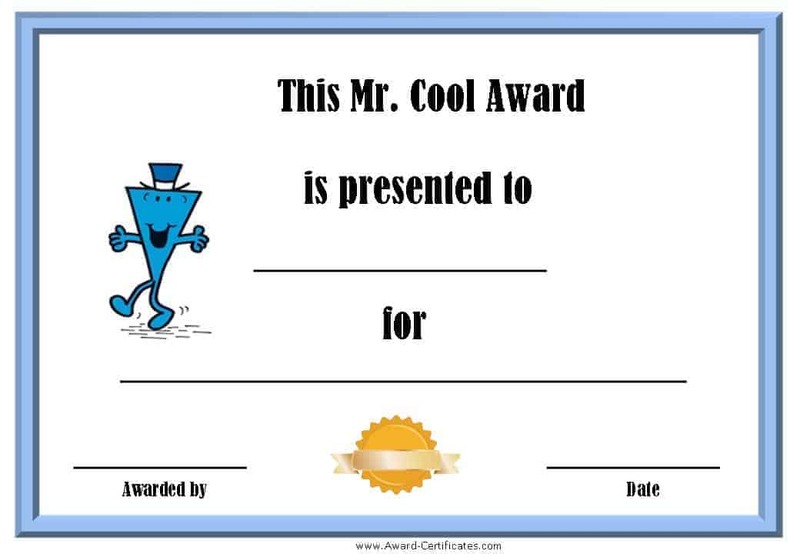 These certificates are perfect for good behavior, being good at something or pretty much for any reason. 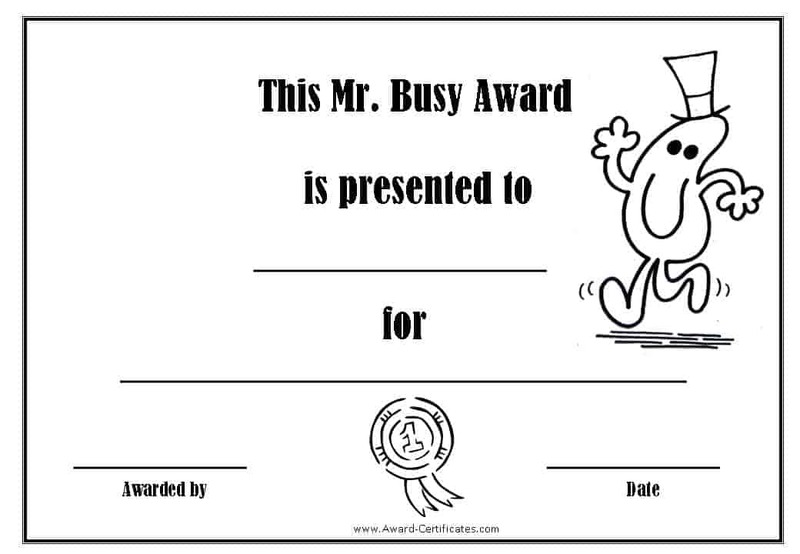 Do you know someone who keeps bumping into this? 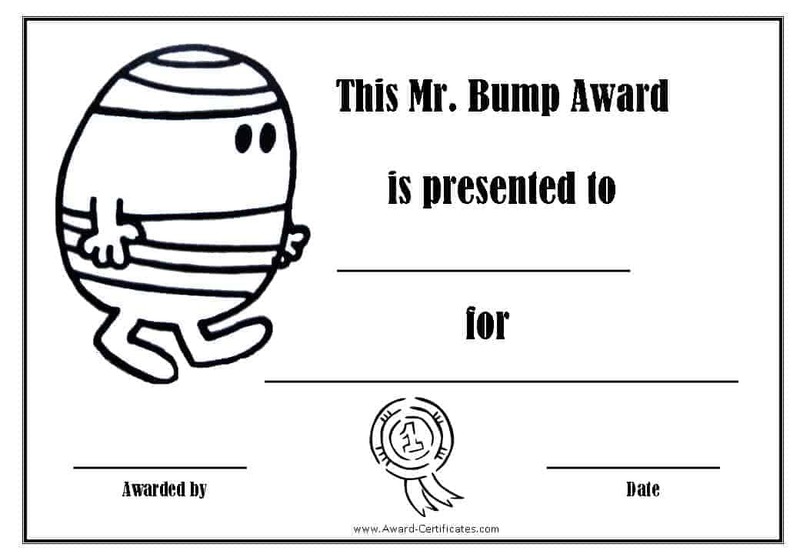 Some people can bump into an elephant if it gets in their way. 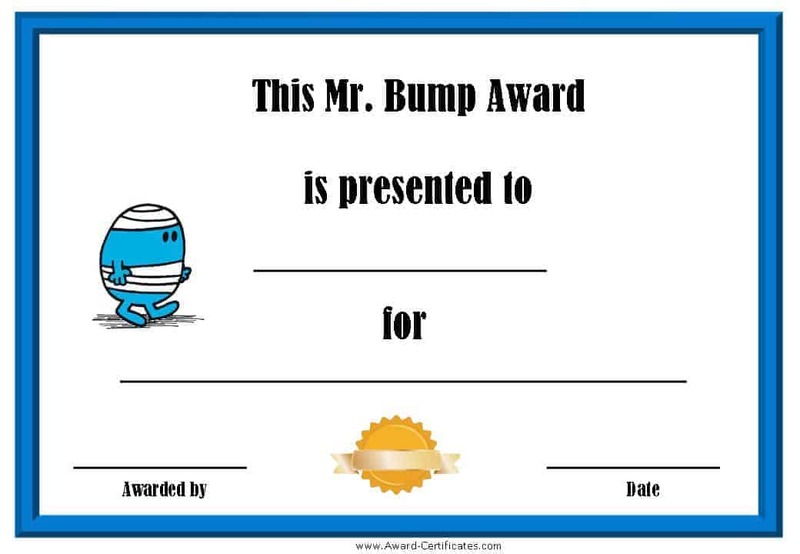 If you know someone like this then print him a Mr Bump Award Certificate. 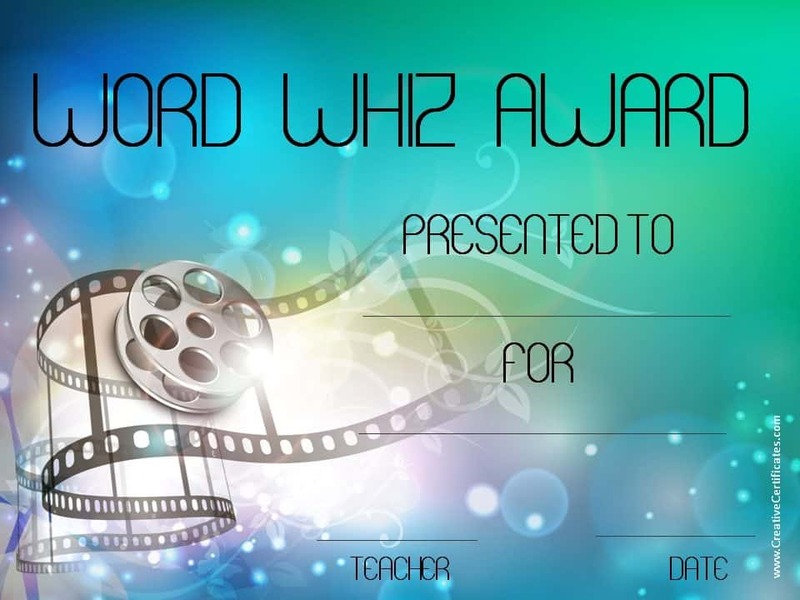 Who are the Mr Men? 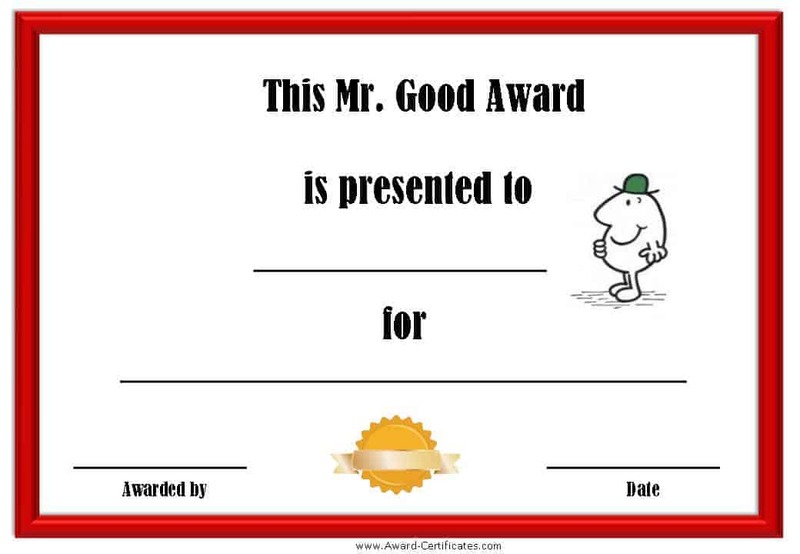 The Mr. Men books are a series of 49 books for kids. 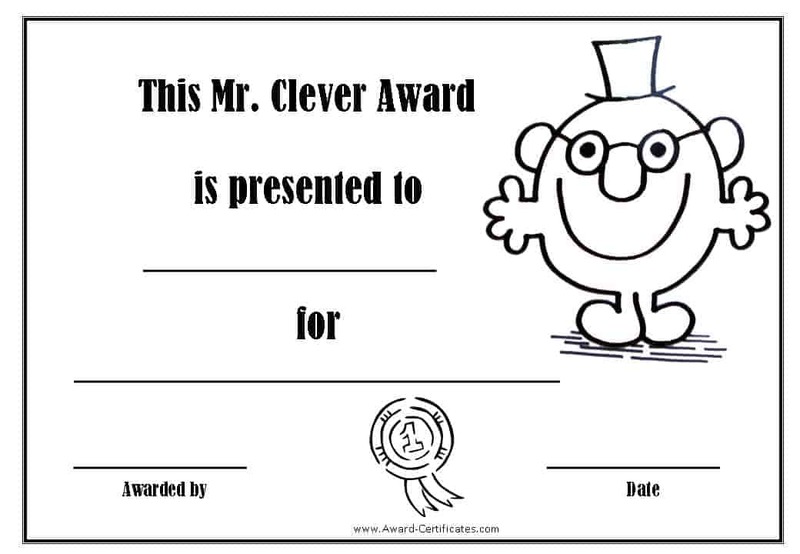 Each book features one of the Mr Men. 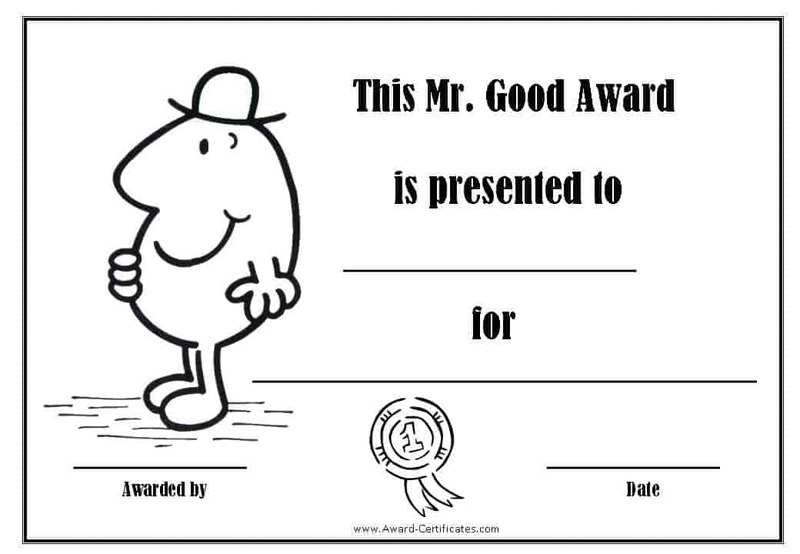 Each Mr Men character has a personality and attributes based on his name. 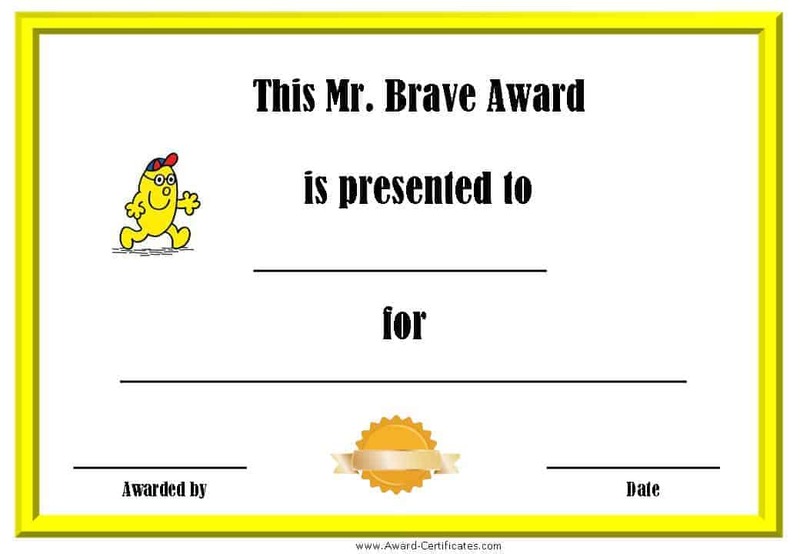 For example, Mr Small is the smallest person in the world. 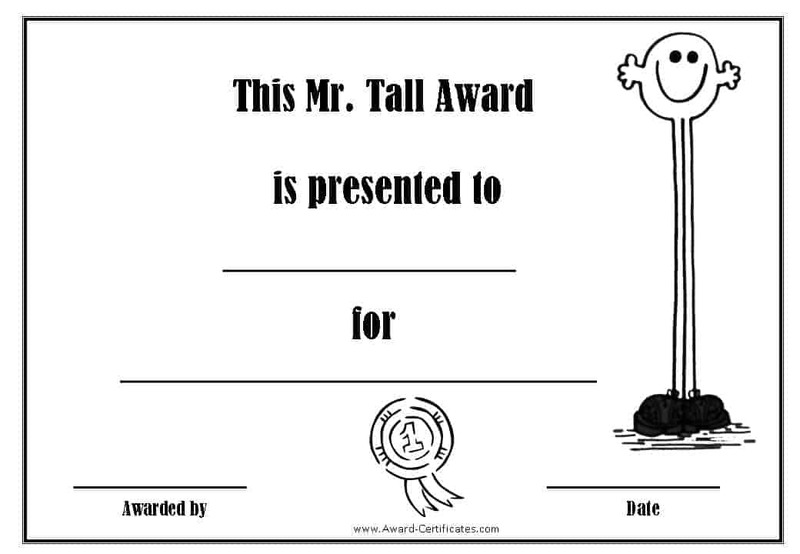 Mr Tall is the tallest person in the world. If you are looking to give award certificates to people with specific personalities or attributes these printable certificates could be just what you are looking for! 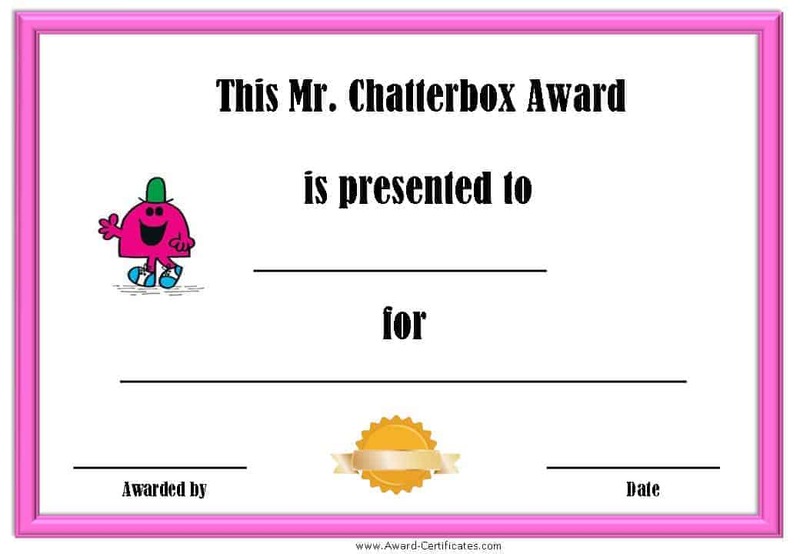 They were originally published by Roger Hargreaves in 1971. When I was a kid I read every book many times and I still have very fond memories of the series. After Roger Hargreaves passed away in 1988 his son, Adam Hargreaves, started writing and illustrating the latest books. 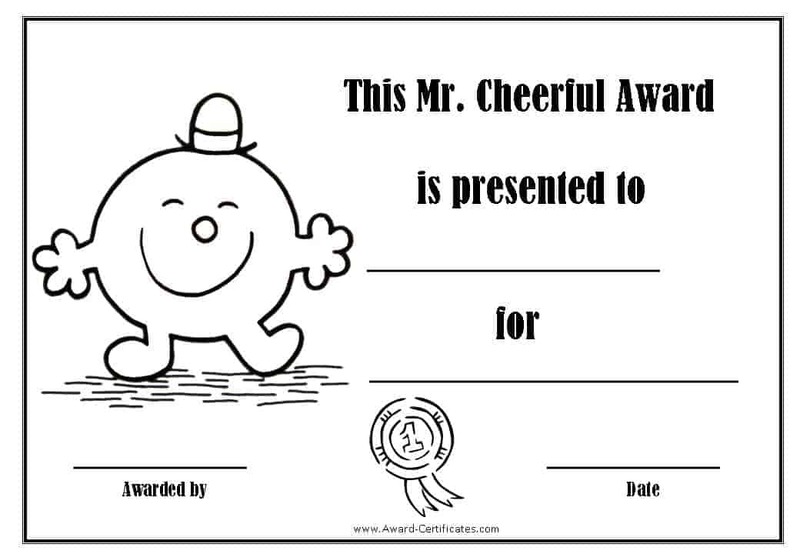 In 2004, Chorion purchased the rights to the Mr. Men and Little Miss characters and later sold them to Sanrio.